This packet is what you need if you have Spanish-speaking language students on your caseload! 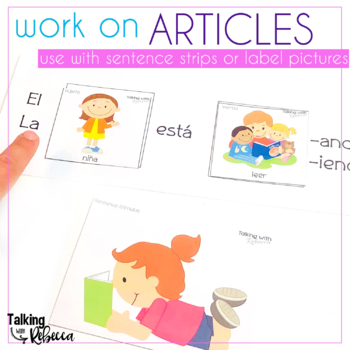 Work on articles, subject verb agreement, present progressive, and more in a practical and visual way with this resource. 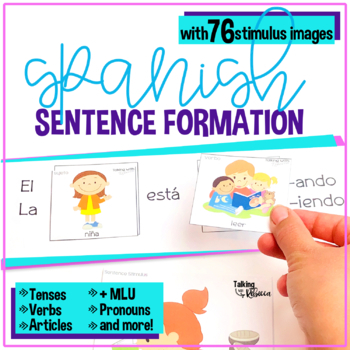 Target multiple grammatical goals to form grammatically correct sentences in Spanish. 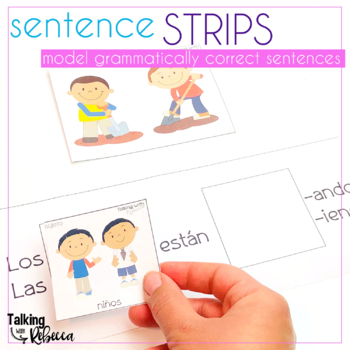 Using the sentence strips, students can practice articles, subject verb agreement, present tense, and -iendo/-ando endings. 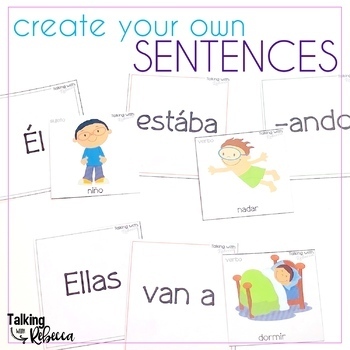 Using the parts of a sentence cards, students can create their own sentences regarding stimulus pictures, or pictures of their own creation (just give them a page to draw on). Use these cards to focus on pronouns, different tenses, passive sentences, and/or expanded sentences. Focus on sentence comprehension by creating a sentence and having students match the picture or draw their own picture to match your sentence.